Cashback Reward : Earn up to 97$! TransStart® KD Plus DNA Polymerase is a genetically modified ultra-high fidelity DNA polymerase in hotstart formulation. 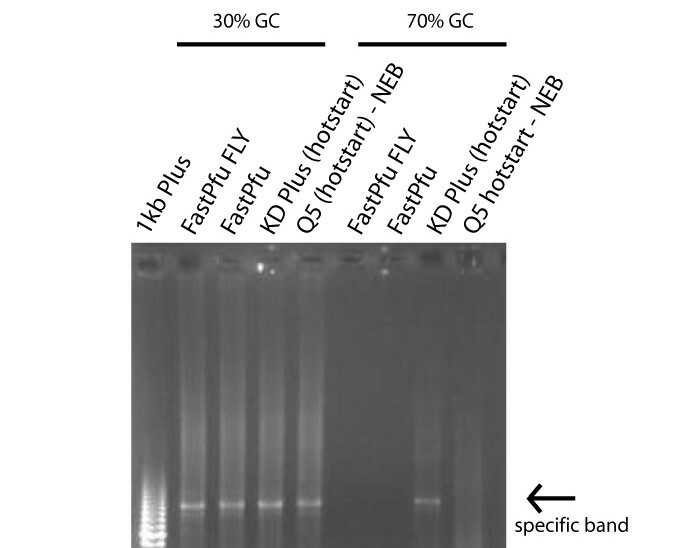 This enzyme provides higher amplification capability than traditional Pfu DNA polymerase and amplification speed equal to Taq DNA polymerase (1 kb/min). 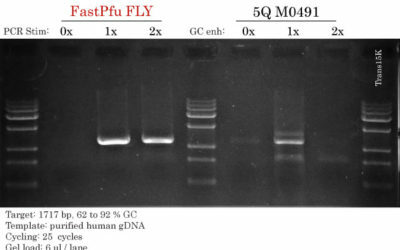 Due to strong 3’-5’ exonuclease activity, this enzyme offers 108-fold fidelity as compared to EasyTaq® DNA Polymerase. It also benefits from the TransStart® double Hot start technology. 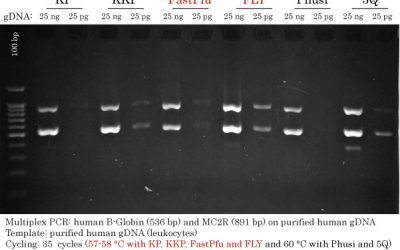 NOTE from Civic Bioscience : In our hands, KD Plus is the High-Fidelity DNA Polymerase of choice for AT-rich PCR that often requires an extension temperature of 62-68°C. PCR product carries blunt ends, which can be directly cloned into pEASY®-Blunt vectors. Its ultra high proofreading capacity makes this polymerase ideal for cloning, library amplification and other application requiring excellent fidelity. Available with or without 2.5 mM dNTPs (1 ml) for additional convenience. one of the most powerful polymerase I ever used. I recommend!!! five stars!!! I succeeded amplifying a 2.5k fragment with KD PLUS and trying to amplify another fragment. Before that, I tried FastPfu but it seems like KD Plus is optimal for my case. User comment and results submitted by email from a customer at Université de Montréal. For privacy reasons, the amplified genes are not specified. Voici le gel dont je t’avais parlé. La piste 8 est la plus révélatrice. Tu peux la comparer aux autres enzymes 6,7 et 9. 2.à 5. c’était des tests avec une ADN de départ avec GC 30%, même enzymes mais différents primers.